Quiz: How Well Do You Know Sci-Fi Books? Quiz: How Well Do You Know Sci-Fi Movies & TV? Quiz: Do You Know Chicago’s Music Landmarks? This season of One Book, One Chicago, we're celebrating the theme of Music: The Beat of Our City through Greg Kot's book I'll Take You There. 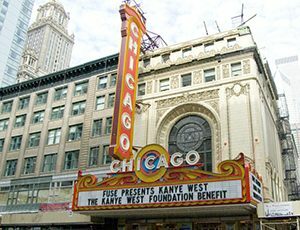 As we explore Chicago's rich musical heritage, we want to know, how well do you know Chicago Landmarks? Take our quiz, written by librarian Mary from the Municipal Reference Collection at Harold Washington Library Center, and find out! Which Southside landmark was the headquarters of a blues record label that featured artists like Willie Dixon and Muddy Waters? This building featuring Romanesque architecture opened in 1889 and has had musicians such as Jimi Hendrix, Aretha Franklin and Elton John on its stage. These “twin theaters” were built by New York theater producers in 1922 and have featured theater, music and dance performances. Built in 1922 in a Middle Eastern "Moorish" style, this Southside gem has been a center for performing arts in the city’s African American community. This Art Deco landmark resembling a gigantic chair facing the Chicago River was built between 1927 and 1929. This Classical Revival-style theater built in 1921 was called the “Wonder of the World” at that time. It fell into hard times in the 1970s, but it was renovated in the 1980s. This building built in 1892 in Pilsen was named for the muse of comedy and pastoral poetry. It was closed to the public in the 1960s but reopened in 2013 and continues to be restored to its former glory. Built in 1901 by a Chicago-area piano manufacturer, this French Renaissance Revival-style architecture building is on the Near North Side. This humble former automobile garage was built in 1909 and became a mecca for early jazz. How is the information I enter in this webform being protected? Any information you send using this webform is protected in transit with SSL encryption. Information submitted in this webform is secure. Learn More.